Full-disk spectroheliograms have been routinely taken in Coimbra since 1926 in the Ca II K-line (K1 and K3) and in 1990 regular observations in the Hα line have also started (sample spectroheliograms can be downloaded here). In 2006, the Astronomical Observatory of the University of Coimbra (Coimbra, Portugal) – Observatório Astronómico da Universidade de Coimbra (OAUC) organized an international solar physics meeting (the first Coimbra Solar Physics Meeting - CSPM2006) jointly with a historical session commemorating the life and work of Prof. Francisco Costa Lobo (1864-1945) who installed the spectroheliograph in Coimbra in the 1920s. On June 22, 2013, UNESCO added the University of Coimbra, one of the oldest European universities founded in 1290, to its World Heritage List. Now, we invite again a wide scientific community to join us in 2015, this time for discussing the state-of-art of solar ground-based and space-based observing techniques and related topics. This meeting is included in the celebration of the 150 years of Geophysical Institute of the University of Coimbra. It will take place in the University campus just inside the Coimbra historical down-town and will also include an excursion to the Coimbra Observatory which is located at the city periphery. The Sun and its activity affect the entire heliosphere, including the Earth. Solar activity includes flares, coronal mass ejections (CMEs), eruptive prominences and filaments, outbursts at various spatial scales, sunspots, and plages. All these phenomena are driven by the magnetic field. Although these phenomena appear at time scales from seconds to months, the long-term variation of the magnetic field during the 11-year solar cycle modulates their frequency and space weather impact. Coronal phenomena are driven by the dynamo-generated fields that show large-scale organization. Solar magnetic fields can be investigated from ground and space. Ground based observations of solar magnetic fields using polarimetry has a long history, contributing to the understanding of long-term behaviour of the Sun. Spectropolarimetric observations in FUV and EUV lines can only be made from space; they represent virgin territory and they are urgently needed for exploring the magnetic activity of the upper chromosphere and transition region. 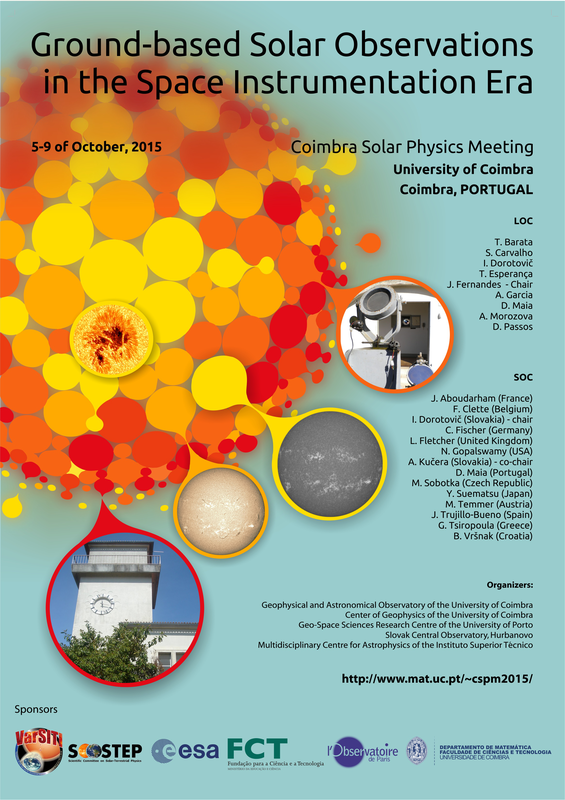 This CSPM-2015 scientific meeting will cover various aspects of solar dynamic and magnetic phenomena which are observed over the entire electromagnetic spectrum: white-light, Hα, Ca II, and radio from ground and in a variety of other wavelengths (white light, UV and EUV, and X-rays) from space. Emphasis will also be placed on instrumentation, observing techniques, and solar image processing techniques, as well as theory and modelling through detailed radiative transfer in increasingly realistic MHD models. The long-term (cyclic) evolution of solar magnetism and its consequence for the solar atmosphere, eruptive phenomena, solar irradiation variations, and space weather, will be in focus. Here, special attention will be devoted to the long-term observations made in Coimbra and also to the results of the SPRING / SOLARNET and SCOSTEP VarSITI studies. In particular, the weak solar activity during the current solar maximum will be discussed. Finally, since this meeting is organised around the 90th anniversary of performing the first spectroheliographic observations in Coimbra, a session will be specially dedicated to new solar instruments (both ground-based and space-borne) that will give access to unexplored solar atmospheric features and dynamic phenomena over the coming years. and 350 € per participant for late registration (till 15 September, 2015). The registration fee for onsite registration and/or payment is also 350 €. (a proof of scholarship has to be sent to the LOC). The registration fee includes the Meeting documentation and logistics, coffee breaks, and an excursion to the archeological site of "Conimbriga", a copy (plus shipping costs) of the proceedings, as well as the conference dinner organized on Thursday, October 8. Important: participants should also pay 140 € for each accompanying person (this includes the welcome drink, welcome reception, excursions, and the conference dinner). Other oral contributions have 18 min (plus 2 min for discussion). The maximum size of posters is 130 cm x 180 cm (width x height). Conference PC + Video projector will be available for oral contributions. Several social events are planned during the Meeting. On Wednesday (7 October) afternoon, we plan an excursion to the Geophysical and Astronomical Observatory in Coimbra and the Archeological site of Conimbriga (the ruins of a Roman town, beautiful mosaics). These visits are included in the registration fee. On Thursday (8 October) evening, we are organizing the conference dinner which is also included in the registration fee. Those who need visa (participants and/or accompanying persons) to enter Portugal have to contact a Portuguese Embassy well in advance. If you need a letter of invitation, please contact João Fernandes at: cspm2015@mat.uc.pt and jmfernan@mat.uc.pt. The poster of the Meeting is available for downloading: PDF-A3-300dpi [11.9 MB] PDF-A4 [442 kB] PNG [4.7 MB] JPEG [1.4 MB]. SEE YOU SOON IN COIMBRA!